The powerful writer Shaktipada Rajguru is an unforgettable name in the world of Bengali literature. He was born in 1922 in Gopebandi area of Bankura, West Bengal. He had an extraordinary talent from his childhood. 'Dinguli Mor' is the first novel of his writing which published in 1945 and refugees life is the contents of the novel. 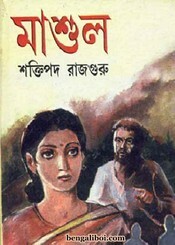 Other famous creations of the author are- 'Meghe Dhaka Tara', 'Moni Begam', 'Antare Antare', 'Jiban Kahini', 'Anusandhan', 'Amanush', 'Baghini' etc. Wrote more than 100 novels throughout his life. He created the character of 'Patala' for children literature. Now I want to share a popular novel of his writing- "Mashul" as a pdf file. The ebook pdf has 175 quality pages with 12mb file size.